Though they are widely considered to be vegetables, avocados are the fruit of a subtropical tree (belonging to the Lauraceae family) that grows in Mexico and South America. There are perhaps 500 varieties, which produce fruits ranging in size from egg-shaped to heavy pears. The Aztecs believed they had aphrodisiac qualities because of their shape. The name avocado is derived from the Mexican name ahuacatl, which is a shortening of the Aztec name ahuacacuahatl. Organic avocados are grown without pesticides, fungicides and herbicides. In the United States, avocado oil is patented as a treatment for some forms of dermatitis and arthritis. It is said that long-term treatment helps to relieve eczema. The oil is rich in vitamins A, B, C and E, all of which help to maintain healthy skin. The fruit is full of unsaturated oil that rehydrates skin. It soothes the upper layers of skin and it is good for dry, ageing and peeling skin. 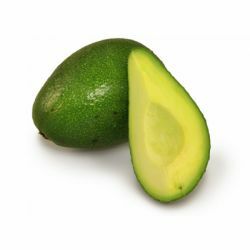 Avocado oil is reputed to be beneficial in reducing age spots and the appearance of scars, treating wrinkles and fine lines, and in protecting against ultraviolet rays. Unruly or dry hair will benefit from avocado, too. We use fresh, organic avocados in our Jungle solid conditioner and H’Suan Wen Hua hair moisturising treatment to nourish and soften the hair, leaving it strengthened and conditioned. Our Avobath Bath Ballistic contains fresh, organic avocados for their moisturising properties, meaning that your entire body will be softened, while the uplifting and stimulating essential oils charge your mind. We use organic avocado in our King of Skin body butter, drenching the skin with unsaturated oil to improve its appearance.